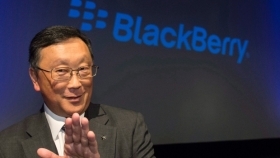 BlackBerry CEO John Chen says he's heard people "in the know" mention the year 2025 as the year fully autonomous vehicles arrive. He's not so sure. BlackBerry CEO John Chen believes new safety discussions around autonomous vehicles are irrational, even in the wake of fatalities like the one in Arizona earlier this year. Chen believes having a driver at the wheel defeats the purpose of self-driving technology. That said, he believes autonomous vehicles are still a ways out — likely beyond 2025. “The technology and automotive sectors should take the time to get it right,” he said. You can watch Chen’s entire interview in the video player below.